Financial stocks, which used to be great dividend investments, have had their share of troubles over the past two years. The sector has rebounded sharply since hitting its lows in March. Since the major dividend growth stories of the past such as Bank of America (BAC) and US Bancorp (USB) have cut dividends, most dividend growth investors seem to have a very low allocation to the sector. As a result dividend investors could suffer inferior risk adjusted returns in the future since they won't own any financial stocks. There are several alternatives for investors who are underweight the financial sector right now. One of them involves purchasing shares in some of US insurance companies such as Aflac (AFL) or Chubb (CB), which offer decent yields and have a long history of dependable dividend growth. Toronto-Dominion Bank (TD) , Bank of Montreal (BMO), Royal Bank of Canada (RY), Canadian Imperial Bank of Commerce (CIBC) and Bank of Nova Scotia (BNS). Buying Preferred stocks could also be a decent bet on the long recovery of US financial institutions. Preferred shares have a higher ranking than ordinary shares in the event of a bankruptcy, but a lower priority relative to bonds. Preferred stocks do not have voting rights but have a fixed dividend payment, just like a bond. Preferred stockholders are also first in line to receive dividend payments, which are typically fixed. They don’t typically get to share in the prosperity of the enterprise however as preferred stock dividends do not increase. In tough economic conditions however, preferred stock dividends are much less likely to be cut or suspended; as long as the company continues operating as a going concern preferred stock dividends continue getting paid. In addition to that if you buy a cumulative preferred stock, the company is obligated to pay distributions to you even if it skips a few payments. That is of course as long as the company is not bankrupt. These two ETFs PFF and PGF are good vehicles to gain exposure to preferred stocks. Most of the issues they hold are in the financial sector. Some investors also believe that the major US financial institutions would one day return to their former glory. This could mean that companies like Bank of America (BAC), Citigroup (C) and US Bancorp (USB) could yield very decent returns if they were to increase distributions to their 2007 levels. This option of getting exposure to financials is the riskiest of all, since most of the TARPed financial institutions are already paying billions in dividends to the Treasury every year. In addition to that the Treasury and other strategic investors might elect to convert their preferred stock into common, which would dilute existing shareholders. Last but not least it is very difficult to forecast how the US banking industry would look like a few years from now. Just because a bank survives the meltdown, does not mean it would be a solid long-term investment. The strong gains off the March lows have definitely pushed financial stocks in overbought territory. Thus, if you believe that owning US banks provides you with the best exposure to the US financial sector, you might consider waiting to buy them on pullbacks. These options could either be used on a standalone basis or in a combination. As a dividend growth investor I currently own mostly insurers and have a position in one of the Canadian banks. I might add to my Canadian exposure, which also provides international diversification for my portfolio. Aflac Incorporated, through its subsidiary, American Family Life Assurance Company of Columbus (Aflac), provides supplemental health and life insurance in the USA and Japan. The company is member the S&P Dividend Aristocrats index. Aflac has consistently increased dividends for 27 consecutive years. The company announced a 16.70% dividend raise in October 2008. 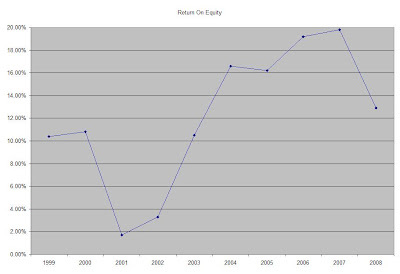 Between June of 1999 up until June 2009 this dividend growth stock has delivered an average total return of 3.90% annually. The stock fell from its all time high of $68.81 in 2008 to a multi-year low of $10.83 in March 2009, before recovering by 300% off its lows. The company has managed to deliver a 10.80% average annual increase in its EPS between 1999 and 2008. Aflac is expected to earn $4.70 share in FY 2009, followed by $5.15/share in FY 2010. The company generates over 70% of its revenues in Japan. New distribution channels in the country for Aflac’s supplemental health and life insurance plans, which are not covered by Japanese healthcare, would drive sales in the future. The brand recognition that the company is building in the US should also be a strong driver of growth over time, in addition to focusing on retirement services targeting the baby boomers. The Return on Equity has ranged over the past decade between a low of 12% and a high of 19%. Rather than focus on absolute values for this indicator, I generally want to see at least a stable return on equity over time. Annual dividends have increased by an average of 22.90 % annually since 1999, which is higher than the growth in EPS. The disparity is mostly due to a gradual increase in the dividend payout ratio and the amounts this insurer has spent on stock buybacks. A 23 % growth in dividends translates into the dividend payment doubling almost every three years. If we look at historical data, going as far back as 1986, Aflac has actually managed to double its dividend payment every four and a half years on average. The dividend payout ratio has increased rather sharply over the past two years, but is still much lower than my 50% threshold. A lower payout is always a plus, since it leaves room for consistent dividend growth minimizing the impact of short-term fluctuations in earnings. Currently Aflac is trading at 16 times 2008 earnings, yields 2.70% and has an adequately covered dividend payment. I would be looking forward to adding to my position in Aflac (AFL) on dips below $37.30. Cincinnati Financial (CINF) surprised investors in a positive way, after the provider of property, casualty, personal, and life insurance products to businesses and individuals in the United States upped its quarterly dividend from 39 to 39.5 cents/share. Kenneth W. Stecher, president and chief executive officer, commented, "The company has consistently increased dividends for 48 years, and the board of directors chose to continue that record for the benefit of our shareholders. This action demonstrates their confidence in our strong capital, liquidity and financial flexibility and in our initiatives to improve earnings performance." The company last increased its dividend in 2008. If it hadn’t raised it in 2009, the Cincinnati, Ohio based insurer would have been booted out of both the dividend aristocrats and dividend achievers indexes. The company is a hold for me right now, as it has pretty disappointing short-term EPS prospects. Its insurance premiums are under pressure on increased competition. It might not be able to cover its dividend payment by a factor of 2 until 2010 or 2011. Half of the company’s investment portfolio was allocated to equities in 2007. The losses in the stock markets and an initiative to reduce equity exposure lead to a decrease in the equity exposure to 33% in 2008. Three other companies announced dividend hikes over the past week as well. Getty Realty Corp. (GTY), which engages in the ownership and leasing of retail motor fuel and convenience store properties, and petroleum distribution terminals, increased its quarterly dividend from 47 to 47.50 cents per share. This dividend achiever currently yields 8.50%. ITC Holdings Corp. (ITC), which invests in the electricity transmission grid to improve electric reliability, improve access to markets, and lower the overall cost of delivered energy, increased its quarterly dividend by 4.90% to 32 cents per share. This is the fourth consecutive dividend increase for ITC Holdings Corp. since the company went public in 2005. The stock currently yields 2.60%. Nordson Corporation (NDSN), which manufactures equipment used for precision dispensing, testing and inspection, and surface preparation and curing., increased its quarterly dividend by 4.10% to 19 cents per share. This represents the 46th consecutive year of annual dividend increases for this dividend achiever. The stock currently yields 1.50%. Berkshire Hathaway (BRK-B) just posted its 13-F filing with the SEC, which lists changes in its stock positions. Buffett initiated a new position in medical technology company Becton Dickinson (BDX) in the second quarter. The sec filing shows Berkshire Hathaway purchased.1.20 million shares in Becton Dickinson (BDX). Becton Dickinson is a dividend aristocrat, which has raised distributions for 36 years in a row. Berkshire added 4.4 million shares to its position in health care giant Johnson & Johnson (JNJ). This is the second consecutive addition to its holdings there. Johnson and Johnson (JNJ) is another dividend aristocrat, which has rewarded shareholders with 47 years of consecutive dividend increases. Check my analysis of the stock. Those recent moves by Buffett reiterate my convictions that he is a closet dividend investor. Most companies that have managed to increase their dividends for long periods of time are ones that have wide moats as well as excellent competitive advantages in the marketplace. Having these qualities leads to rising earnings which tend to support a steady pace of increase in dividends. Berkshire eliminated its position in utility company Constellation Energy (CEG). This wasn’t a surprising move since Buffett’s company had already disclosed this sale in a June 1 filing. Berkshire Hathaway disclosed lowered stakes in Carmax (KMX), ConocoPhillips (COP), Eaton Corporation (ETN), Home Depot (HD), United Health Group (UNH) when comparing June 30 to March 31 filings. In a July 22 filing Berkshire Disclosed it had also cut its stake in the credit rating company Moody’s (MCO) by 16%. Over the past several months Berkshire Hathaway has been allocating funds to preferred stocks with at very good prices. The company has invested billions in preferred shares of companies like Goldman Sachs (GS), General Electric (GE), Tiffany’s (TIF), Harley Davidson (HOG) and Dow Chemical (DOW). Some of these deals deliver not only solid yields in the low double digits, but also give warrants which could provide solid capital gains if these stocks recover over the next few years. What this filing does not show however is the fact that Buffett’s conglomerate “goofed on derivatives”. While there may be more buzz than actual news and the SEC issues have been resolved, it is interesting how Buffett talks one thing but then does exactly the opposite of what he preaches. He’s always held a view against derivatives, yet his company has always engaged in options selling, futures and insurance derivatives. One of his riskiest trades is the selling of puts on four major world stock indices, which expire somewhere between 2018 and 2028. Berkshire assumed over $37.50 billion in potential liabilities in the process, and has already lost $8 billion on them at the end June 2009. If world stock markets resemble the Japanese stock market of the second “lost decade” for the country with the rising sun, then Berkshire would be on the hook for almost half the $37 billion in assumed liabilities. Two more dividend aristocrats raised their distributions last week, bringing the total number of raisers in the elite index to 30. This is quite impressive, given the fact that there are almost 5 more months to go before the year is out and that there are only 51 components in it. Dover Corporation (DOV), manufactures industrial products and components, as well as provides related services and consumables in the United States and internationally, increased its quarterly dividend by 4% to 26 cents per share. Dover Corporation is a dividend aristocrat, which has increased its quarterly dividend in each of the past fifty-four consecutive years. The stock currently yields 2.90%. Leggett & Platt (LEG), which designs and produces a range of engineered components and products worldwide, increased its quarterly dividend by 4% to 26 cents per share. Leggett & Platt is a dividend aristocrat, which has increased its quarterly dividend in each of the past 38 years. The stock currently yields 5.80%. The company has been unable to cover its dividend payment in 2007 and 2008, so this move is definitely a surprising one from this High-Yield dividend stock at risk. On the positive side, over the past two years the company had a $1.42 and $1.16 in cash flow per share, which still barely leaves any funds for other activities. Another positive fact is that the company has announced that as long as cash flows from operations exceed $300 million, which is enough for capex and distributions, dividends are safe. Aqua America (WTR), which operates regulated utilities that provide water or wastewater services in the United States, increased its quarterly dividend by 7.4% to 14.50 cents per share. Aqua America is a dividend achiever, which has increased its quarterly dividend in each of the past eighteen years. The stock currently yields 3.00%. Carlisle (CSL), is a diversified global manufacturing company, increased its quarterly dividend by 3.20% to 16 cents per share. This marks the 33rd consecutive year of dividend increases for Carlisle, which is a member of the dividend champion’s list. The stock currently yields 1.90%. On July 29, 2009, the Board of Directors of Church & Dwight Co (CHD), which evelops, manufactures, and markets a range of household, personal care, and specialty products under various brand names in the United States and internationally, increased its quarterly dividend by 55.60% to 14 cents per share. Church & Dwight Co is a dividend achiever, which has increased its quarterly dividend in each of the past thirteen years. The stock currently yields only 1.00%. BCE Inc. (BCE), which provides a suite of communication services to residential and business customers in Canada, increased its quarterly dividend by 5% to 40.50 Canadian cents per share. This increase is funded from free cash flow and is consistent with the company's target dividend payout ratio of 65% to 75% of Adjusted EPS. The stock currently yields 6.10%. Apollo Investment Corporation (AINV) announces that its Board of Directors has declared its second fiscal quarter 2010 dividend of $0.28 per share. Apollo Investment Corporation is business Development Company specializing in investments in middle market companies. Apollo Investment Corporation cut its quarterly per share distributions by half in 2009, from $0.52 to $0.26. The current distribution raise is a positive, as long as the company can sustain the momentum of distribution raises over time. The stock currently yields 14.00%. Chemed Corporation (CHE), provides hospice care services, increased its quarterly dividend by an astounding 100% to 12 cents per share. Before you get too excited about this dividend increase, please be alert that this is the first raise since 2002; furthermore the new distribution of 12 cents/share is still way below Chemed’s 26.50 cents/share quarterly distribution before it cut its dividends in 1999. The stock currently yields 1.10%. Atrion Corporation (ATRI), which designs, develops, manufactures, sells, and distributes products and components for the medical and healthcare industry, increased its quarterly dividend by 20% to 36 cents per share. Atrion has consistently paid and increased its quarterly dividend since 2003. The stock currently yields 0.90%. Despite the recent outperformance of speculative stocks since March 2009, long term investors are beginning to put their money in stable companies which share portions of their profits with shareholders. While markets can go up and down, creating and destroying capital gains in seconds, investors who focus on getting "a bird in hand" should do well overtime as they receive an ever increasing stream of income from their investments. Despite Avery Dennison's recent dividend cut, the dividend aristocrats index appears to be business as usual in 2009. The dividend aristocrats represent S&P 500 members which have consistently raised their dividends for more than 25 consecutive years. At the end of 2008, there were 52 constituents in the index. 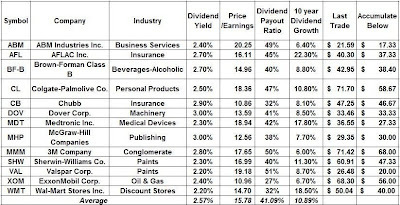 Dividend growth investors typically use the Dividend Aristocrats and the Dividend Achievers Indexes as a starting point in their additional stock research. The changes in the Dividend Aristocrats index should be expected and they are a natural process that occurs even in normal years. The index is relatively well diversified between different sectors, which helped soften its decline over the past 2 years, relative to the S&P 500.